With just the right mix of vintage (mostly rockabilly memories this week) and a bright and shiny selection of new Americana, Blue Moon makes light of the airwaves this week with sounds for you…our listeners across the world. 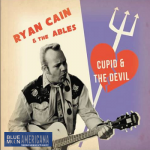 Tune into Sonoma County community radio for new music from Ryan Cain and the Ables, Southern Avenue, Steve Forbert, Jaime Wyatt and Rodney Crowell. It’s all in good, healthy reverence for sounds from the Americana playbook.